For waste management authorities and landfills, worn out tires are among one of the most problematic and largest sources of waste. But tire recycling offers a number of profitable business opportunities as rubber can be reused in different ways. For too long, old tires were stockpiled. 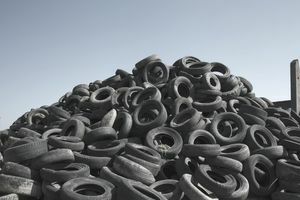 According to the U.S. Tire Manufacturers Association (USTMA) https://www.ustires.org/scrap-tire-markets, only 11 percent of old tires were "consumed in beneficial end-use markets" in 1990. By 2015, end-use markets consumed 87.9 percent of scrap tire generation. Tire-Derived Fuel (TDF). TDF generates more heat than a similar weight of coal. As such, TDF provides an attractive and cleaner alternative to coal for use in cement kilns, pulp and paper mills, and electric utility boilers. In 2015 the TDF market consumed 117 million scrap tires, over 48 percent of the annual U.S. scrap tire generation. Civil Engineering: Shredded tires are becoming more popular as a substitute for sand or clay in landfill and road construction, landfill cover, septic tank fields and many construction jobs. Civil engineering applications made use of 17 million of tires in 2015, around 7.7 percent of the total. Other Markets: Other scrap tire opportunities include powering electric arc furnaces, professionally engineered tire bales, and products punched, stamped or pressed from scrap tires. These activities account for about another 7 percent of production. To read the complete U.S. Scrap Tire Management Summary, click here. As a first step in exploring the opportunity to start a tire shredding business, you first need to identify local opportunities to source old tires, and for customers to purchase your processed scrap. It pays to "follow the old tires" in order to understand what happens to them. Are they being regularly picked up? Where do they go? Check out the ongoing scrap tire businesses in your area. If you see tire accumulations, are there unfulfilled needs for old tire removal, or customers interested in purchasing the processed material? The optimal site location depends on several variables. Some of them are predicated on minimizing freight costs related to bringing in scrap tires and shipping out processed material. And while tire source and markets are of critical importance, it goes without saying that other business location factors must be considered such as zoning and permits, environmental considerations, adequate space for storage, unloading and loading, as well as road access. Not preparing a complete business plan can create problems after starting your business. So, try finding similar businesses, or talking to entrepreneurs or tire recycling equipment vendors, know what it takes to start a shredding business and prepare a complete business plan. You may be able to find tire recycling business plans online for free, or available for purchase. Another prudent step might be to first seek work in the tire recycling industry to gain a better understanding, if your timeline permits, or perhaps creating at first a smaller, related business such as an old tire hauling service. Depending on the desired size of your business, you will have to buy dumpers, conveyors and other material handling equipment. Prepare for a minimum investment in equipment of at least $100,000. Once you have a complete business plan, including a financial strategy, you are ready to set up shop in terms of renting a property, if necessary, as well as acquiring the machinery necessary for a tire recycling business. As you already inquired for prices need equipment at the time of preparing your business plan, you have some confidence as you go about the business of acquiring machinery. In the steps above I have outlined in a very simple fashion the rudimentary steps necessary to embark on a tire recycling business. And keep in mind that the shredding or grinding of material translates to other recycling opportunities, such as asphalt shingle recycling. Of course, there are numerous challenges and financial risks involved in any entrepreneurial venture of this nature, and anyone considering such a venture should undertake thorough due diligence. To explore the opportunity in more detail during your business plan development, consider attending the Scrap Tire Research and Education Foundation's Scrap to Profit Conference or subscribe to industry publications such as the Scrap Tire News.